Where Are All the Spoons? Somewhere there is a fairyland inhabited by spoons. There they retire to dance around together like the scene from “Be Our Guest” in Beauty and the Beast. 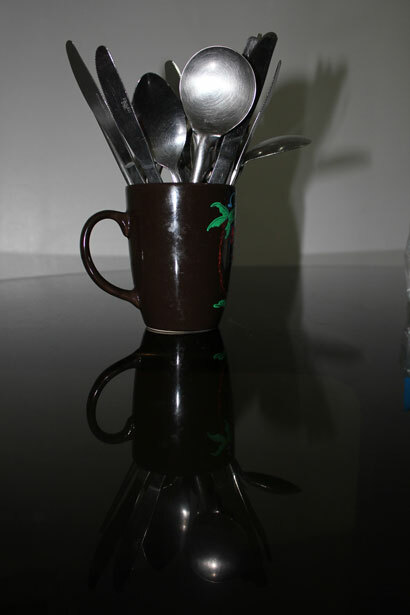 There are all sizes, types, and substances – from large to small, teaspoons to soup spoons, real silver to stainless steel. Whenever one of my family digs through the drawer looking for a spoon for their cereal or bowl of ice cream, I wonder if those lost spoons are enjoying themselves. I think they plot their escape when they’re nestled in the dishwasher basket together, since that’s where ours spend most of their time. Yet no matter how desperate we are for a spoon, no one – including me – is ever willing to dig in the basket and actually take the time to hand wash one. The spoons must be very exclusive about their club since we usually have knives and forks in abundance. Perhaps objects with tines or points are not welcome there. So in that far off land, I hope all our spoons are happy – and I bet they frolic in the shade from the mountain of our missing socks! As I was reading your post, I thought about missing socks…which you mentioned at the end. Great minds thing alike! If you figure out where these spoons go, please, please let me know!